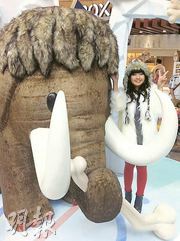 The mammoth doll was so cute! 【明報專訊】Environment protection is an important issue that is worth our concern. I joined two promotion events about environment protection last week. One was a campaign called "Take a Brake" Low Carbon Action, which promoted turning off the engines (引擎) during waiting periods to reduce carbon emissions (碳排放).